You're the mellow friend. The one who looks after others when they're in need. The one who drinks the tea with honey and milk infused in your drink. And hearts on your sleeves, you're the one who gives flowers. But you're also the one who grows them. Your story is normal but there it was mystical in its simplicity. Then comes the dream that enters your life one summer day. Bells chiming in the background, a Good Morning! stuck in the back of your throat, and pastels at peripherals. Inevitably, her eyes land on the letter tucked in between the pages of her book. It was a letter from her family containing what she thinks is the most significant of judgments for her particular gamble. She'd just been beginning to feel uncharacteristic anxiety well up when a series of distracting chirps captured her attention until it rested on an ever constant, hovering Beekadoodle. Her concerns quickly melt into fondness as Chirrups lands on her shoulder; comforting quips coming from the bird. Her mention of gratitude was interrupted by the ringing of her store bell, in turn spooking the pixie into hiding. She shrugs and turns to face her new customer with a dazzling smile. What greets her is a boy around her age, rough and looking like he just stepped out of a fight. Still, the pleasantly interested look on his face seems welcoming when he finally notices her and turns around to ask, "Hey, I'm kinda a bit lost, but I needed some flowers," an unsure demeanor passes through him, "I didn't know you had so many, though. Er- what do you get for a girl that doesn't like pink?" Carol blinks, "Oh? What's it for?" For a minute, the boy just blushes a bit until he says, "Just wanted to thank my sister for saving me out there a while ago. That's not manly is it, though?" looking a bit shy. She answers immediately, of course, "No! Family is always something to treasure." she moves towards the shelves to browse for options. "Seeing as you don't seem to be looking for anything pink, I'm guessing roses are also out..." She looks contemplatively at the Sweet Peas but move instead to a much smaller pot of white Camellias. "Maybe, these?" she says sheepishly. Once the boy - Prohyas - has thanked her and purchased the pot, with a renewed sense of bravery, Carolina moves to read her letter. Acts of Kindness: A random act of kindness, no matter how small, can make a tremendous impact on someone else's life. Carolled allows a moment's thought of grief over the broken pot below her feet, but understandably, it perishes not even a second after it's been conjured. She's a bit too busy staring down at the hovering spectre in front of her. When she finally relaxes and inspects the skittish thing more closely, she sees a semi-familiar sheen on its wings and hears the dainty jingles she'd always thought was the wind. What started the idea was a small light rain in the beginning of the Month of Running. She was at her own flat, a cozy place that was reasonably affordable with accommodating, if not minimal, facilities. She had been in her kitchen back then and was absentmindedly stirring a fresh cup of tea when she just timely looks up and it starts. The barest pitter-patter of rain begins, and her small house plants happily soak it up in their place just by her windowsill. This certain weather had turned into a heavy pour in a matter of minutes. She'd been so lucky to have caught those last moments when the sun was still there and the summer drizzle had made subtle yet beautiful rainbows that briefly lit the house. It was in those few seconds that she had suddenly thought, Hey, I think I want to have a garden. Passion coursed through her, and immediately after the rain had let up - it had lasted for a day - Caroline was out the door in record time with a book in her hands about the basics of gardening her mother had accidentally packed back then. She briefly checks online to look up where to purchase some seeds, and in a couple more, meets a store baring her future with a calm smile. For just in the span of two months, with time flying by faster than a jetsam could swim in clear waters (metaphor courtesy of her cousin), she'd already covered all three rooms with flowers and their aromas of many kinds. Orchids being her favorites, though they grow slow and were just barely springing from their buds with a light purple. Next, were the peonies who grew surprisingly fast and have now been moved to stand in bundles prettily outside. Then, there were the the daisies and her herbs which mostly adorn the kitchen. Those would probably stay indoors for longer. She had been busy planning on moving more of her petunias outside, when she thinks she hears tinkles and the buzzes of wings flapping as leaves part. But it couldn't be anything. If anyone would have told her this would be her new life in the span of only months... well, she'd actually laugh in joy. Somehow, it was too possible anyway. Two years later, she risks her education, puts her heart in her sleeves, and opens a store. And that entails the a small drabble for Carolled! Hi guys! Dianne here! To explain, Carol was once a college student studying for Medicine and Care-giving when she had found that she had an apt for all things green. She had then taken gardening as a hobby. She does flowers and herbs but I do plan on expanding some of her choices once I've done the same thing with my knowledge on these subjects. When I'd started, it was a really interesting topic to begin with! Heck, I even had the chance to apply them irl and it'd been so cool. Oh, and if anyone's wondering, it does take about two months or so to grow most small flowers. She's kind of a simple character, really. She believes in kindness, no matter how small and is insanely smart too. It's was kind of conflicting for her to open up the store, since she'd basically just allotted all she had for her it. I'm a bit guilty for letting Carol do that to her mother, though. Not unlike other dolphin species (according to my research, because, yeah, I'm committed to this, darnit! ), she probably only has maybe two other siblings or so. Headcannon that she's also the eldest. But, really, she would just be so full of love that it makes you warm inside when you just imagine her little sanctuary as a florist. Carolina's signature flowers are obviously the orchids, once they bloom. Chirrups is a small pixie that helps Carol with her plants, not that she needs any. There was a time when Carolled hadn't even realized she had such a little faerie following her back then. The Beekadoodle is helplessly in love with how caring Carol could be and so takes her as a master and tries to make her happy in all ways. She fidgets as she tries to reach her destination in a much faster pace; checking her watch to stifle her unease and looking left and right. It was 4:33 AM NST. She wonders if she could have gone earlier. A smile grows in her face, steadily feeding from the cool she usually has as a personality. But, honestly, she couldn't have helped the squeal from her when she saw the innocuous door just up ahead of the street even if she wanted to! After all those set backs she cannot believe she is actually here now. She briefly considers investing in an "open" sign for her store. Phinny is an inventor, inspired by the cartoon, Phineas and Ferb. He is a helpful, naive, and very compassionate person who likes to extend a hand to all those he meet. Of course, this sharing of kindness and gentleness is what ties these two together for most part. Carolina treats Phin like a little brother and best friend. Truthfully, Phinny has often extended his help into making anything for Carol and her garden, but, naturally, Carolina has declined and had offered a light snack with him, instead. Aharu is currently a swordsman in training. Learning not only form and technique but the general knowledge of the normal and abnormal world - meaning, magic. She is very kind, yet, at times, could be snobby. She'd also instantly made friends with Carol. Especially the time Aharu had found out about how knowledgeable Carolina was about many different types of plants. Also, Aharu has a habit of smiling at inordinate times, not knowing she was very much aware of Chirrups following Carol's person. Wisetta is my darling princess that has no specific character but royalty. She is the person that every one of my pets have a friend on. Carol and Wisetta would have met when Wisetta had been out looking for the flowers of her namesake, Poinsettias. Wisetta, though, is an ambivert so she goes along with all my pets as a personal friend. Unfortunately, Carol has had the misfortune of taking care of her now that it's been established that Carolina is the biggest mom friend ever. But with Wisetta's constant attempts to reach out to her albeit closed-off friend, it has a quick effect of erasing any - if there was any - annoyance for Carol's friend and her slight mischief. And that's all there is to Carolled! Thank you for stopping by to visit and we sincerely hope you've enjoyed it and maybe have felt a little bit better? Generally..? Anyway, my commentary had probably ruined it with my silliness though. I mean, I've never felt so relaxed, to be fair. Must be the flowers. I'm so in love with this little fish, honestly. I'd been so lucky to adopt her! 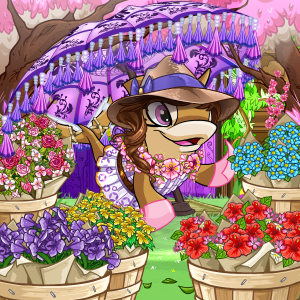 While making the petpage, I'd been so shocked when I found she was created at Christmas too! Just leaving a mail link just in case, as well (But really, it's for Dee).Thanks again and I hope you have a great day! Content and images are product of Dianne. Float came from Silent Serenity and the background from Mariposa. Banner by giphy and palette by colourlovers.